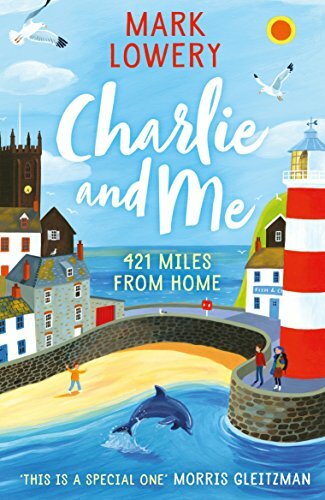 This is a brilliant, emotional story that focuses on the relationship between a young boy and his brother, as they embark upon a huge journey from their family home in Preston all the way to their favourite holiday destination in Cornwall - just to see a dolphin! They are on their own and they have very little in the way of food or money, but they are utterly determined to make it to all the way to St Bernard’s in time for dolphin o'clock. The story is told by Martin, long-suffering older brother to Charlie, who is, to say the least, eccentric. Seriously ill as a child, Charlie has an endearingly weird and wonderful approach to life, chatting merrily with complete strangers, eating ham-and-jam sandwiches and pretending he has CCTV in his belly button. On their way to St Bernard’s, the boys have to contend with fastidious ticket attendants, scary teenagers and very hungry tummies. Martin does his best to keep them on track, but Charlie’s tendency for spontaneous acts of stupidity (such as leaving the train when he sees someone he doesn’t like the look of!) make things even harder. The sibling relationship between the two main characters is thoroughly absorbing. Martin utterly loves his brother but can barely tolerate him...a sensation many readers with siblings will recognise! Mark Lowery describes the closeness between the boys with heart-warming detail, and without unnecessary sentiment. Though the story has plenty of funny and playful moments (two children stuck on a train for hours proves to be a surprisingly rich source of comedy) the overall feeling of the book is one of emotion and drama. This is achieved through Lowery’s wonderful use of first person. Martin shares all his emotions with the reader, whilst keeping key details hidden, and the result is very affecting. He offers flashbacks to the last family holiday in St Bernard’s, and each chapter begins with one of Martin’s own poems. These offer extra clues about the narrative and about Martin’s character. The poems themselves are varied, lively and engaging, and arrive like welcome rest breaks on a long train journey. In Charlie and Me, Mark Lowery has delivered a very special story. Readers will cry with laughter and sadness in equal measure, as they share in the journey of two children on a mission to rediscover whatever the magic ingredient was that made an old family holiday so special.